Horvat Fine Violins and Bows specializes in the restoration and maintenance of historical and modern instruments and bows. The company's true belief is that restoration is a "preservation" of the original authenticity. Additions or changes in restorations are utilized only when deemed absolutely necessary. 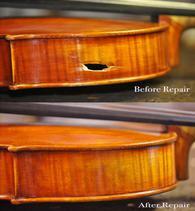 Horvat Fine Violins and Bows is a complete full-service restoration business. Assessments with recommendations, including estimates, are free. Please call or email to schedule an appointment for consultation. "During the last several years Damir has helped with the maintenance of my cellos and bows. He is an expert luthier and I trust his opinions and recommendations for the care of my instruments and bows. His work is top-notch: very careful, deliberate and appropriate. He has done excellent re-hairs on my bows, sound post adjustments on my cello, and repair work, as well as yearly maintenance. His work is dependable and reliable. I recommend him highly."